Product prices and availability are accurate as of 2019-04-01 00:19:43 EDT and are subject to change. Any price and availability information displayed on http://www.amazon.com/ at the time of purchase will apply to the purchase of this product. New and improved design over the hen, AN3000 nibbler. The Bronze slider has been replaced by a heavy-duty Roller bearing. The old bulky cast plunger has been replaced by a lighter yoke. These changes have resulted in smoother operation and better parts life. The plunger, die holder and punch have been completely re-designed: a Screw-On punch Retainer provides easy access to the punch. Replacing the punch is now a breeze, no more tedious aligning access holes and working inside the tool. Just unfasten two screws and pick out the punch from the external T-slot. The new Style symmetrical-punch provides two cutting edges. When the first edge gets dull, just turn it around and get double punch life. For better tool handling, the front handle with a comfortable non-flip rubber grip has been added. It also serves as an additional support when servicing the tool in an upside down position. 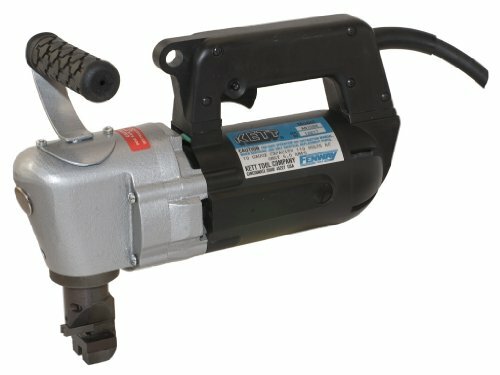 The Hn2 uses a 1-1/4 horsepower, 6 amp electric motor that cuts 10 gauge C.R. Mild steel and most grades of Stainless to 12 gauge at 90" per minute, with a cutting radius of 6".